Just when you think the blues might be sputtering, along comes something so inspired as to make you change your mind. 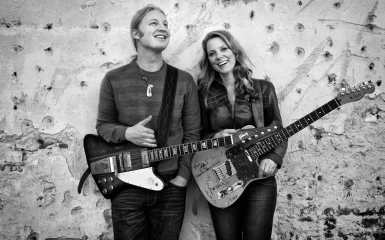 Susan Tedeschi and Derek Trucks spent a good year putting together the Tedeschi Trucks Band, stopping at a member compliment of eleven. That’s right eleven, as in one less than twelve. During that year they assembled all the pieces necessary for the sessions that would produce Revelator (Masterworks): Two guitarists (Tedeschi and Trucks), bass & keys/flute (Oteil and Kofi Burbridge), two drummers, two harmony vocalists, trumpet, trombone, and saxophone. The kind of lineup that could do just about anything they wanted. With the full sound and deeply intense feel of this record, it would seem they did just that. You can sense the elation and emotion each person added to the pot on every single tune. Made up of a dozen original compositions, the first fully collaborative effort for husband and wife Trucks and Tedeschi (both Grammy winners in their own right) comes across like a work from a group that has been together for a decade or more, and for some of them that is true. The Burbridge brothers do have a long history with the Allman Brothers Band (of which Derek is still a member) and various other Trucks projects, as does Tedeschi. There are songs on Revelator that seem like they have to have been around since the early 70’s: “Bound For Glory,” “Simple Things,” “Until You Remember” and the unstoppable “Learn How to Love” all appear as worn in as your favorite old pair of jeans. It’s really great to have seen Derek Trucks go from kid phenom to the accomplished, confident player he has become. I could not be happier for him. Trucks considerable time with the extended Allman family has prepared him to be the southern blues rock standard bearer he is, and will no doubt continue be. Susan Tedeschi sounds as good as she ever has, if not better on Revelator. Her vocals reach out and pull you in. Speaking right to you, like she knows you’re listening. I love this record and cannot wait to hear more of what the Tedeschi Trucks Band will come up with, on what I hope will be a long string of releases. Put me down for a collectors edition of that double live box set, would you? Thanks.